This is a 2 bedroom, 2 1/2 bath condo located directly on the water in a quiet, gated community. It couldn't get much better than that. Everything you need is right here. The sliding glass door in the living area opens onto the ground level patio. The master bedroom door opens onto a tiled veranda affording you another gorgeous view of the ocean. What a wonderful spot for your early morning coffee. Take a short stroll to the sandy beach. It's particularly nice at low tide. If you get tired of the ocean, there's a small pool on the premises and just steps from the back door. In the evening there are tables next to the sea wall just waiting for you to enjoy a glass of wine, or a beer, and some cheese and crackers. Wish I was there right now! So what's stopping you? Plan that vacation now! You deserve it. After visiting the Bahamas for years and staying in hotels and a timeshare, we decided to purchase this property for our retirement! It's turned out to be the perfect place to enjoy the sun, sand, and ocean. This location is quiet, but w/i minutes you can be at the casino, shopping, eating in excellent restaurants, and making your life as busy as you would like. It's all up to you! All you have to do is look outside the glass doors and the ocean is there to greet you! Open up the door and you are greeted with a spectacular view of the ocean right in your back yard. 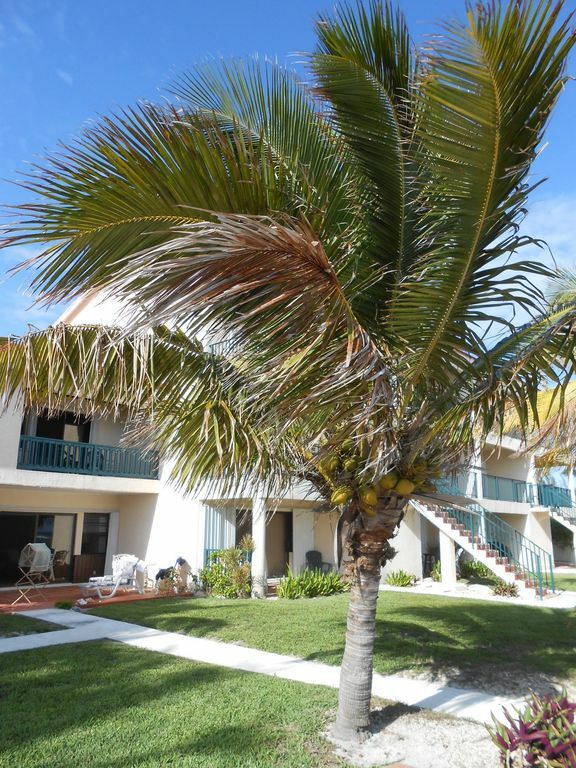 This condo is as represented..clean, wonderful views, walking distance to gorgeous sand and stunning turquoise ocean. We woke up every morning to the sound of the ocean. There is a nice outdoor living space to read and enjoy the view. The owners are very accommodating. Our toaster broke and we had a replacement within hours. A car is needed to go places and driving is on the left. Groceries are fairly expensive so bring some basics with you.The people of the island are very friendly and there is plenty to do! Hope you enjoy your vacation as much as we did. It was a nice respite from our chilly winters! Outstanding, we had a great time. Jean was great and very helpful. Couldn't ask for a better place to stay. Just what we wanted, no hassles. Loved the place so much this was our 2nd stay. The accommodations are great and the private beach amazing. Jean was very helpful as was the building manager Jude. Will definately return. We enjoyed our stay at the Port of Call Condo. The condo was clean and very well furnished and met our needs for our stay. I would recommend the condo and the Bahamas to anyone wanting to get away from it all and enjoy quiet relaxing time sitting on the patio or poolside. Perfect spot ! There is a bit of hurricane damage and debris associated with it, but that is being remedied. We thoroughly enjoyed the setting on the ocean. Condo was very warm and homey. Great view! I stayed here with my husband and 2 high school children over spring break. The condo was clean and well furnished. The view was fabulous! Jean was very prompt in contacting me when I had questions both before we arrived and during our stay. I would highly recommend this condos to others needing a place to stay on the island. A trip to Grand Bahama would not be complete w/o a drive at LOW TIDE to Gold Rock Beach at the Lucayan National Park. The kitchen, living, dining rooms and half-bath are on the first floor; the bedrooms are on the second floor.